Step by step, China aims to reach a clean, pollution-free society and set a plan several years ago for a fully clean environment by 2020, by expanding the use of new and renewable energy and eliminating the use of coal to generate electricity. The continent of Africa, led by Egypt, Ethiopia, Tunisia and Algeria, is at the forefront of China's efforts to build joint ventures in new and renewable energy and to share its fruits. On Friday evening, the China-Africa Solar Forum, with the participation of the embassies of most African countries took place. 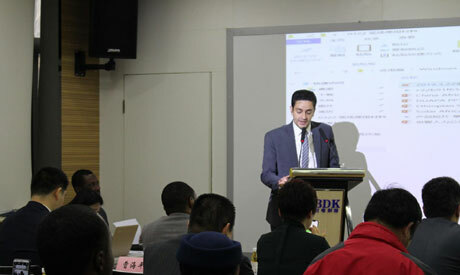 A representative of the Egyptian embassy delivered a keynote speech at the forum, followed by a representative of the embassy of Ethiopia and the embassy of Tunisia. China's major cities suffer from severe pollution of air and water, and the problem of pollution is difficult to face because of the large consumption of coal for the operation of power plants and heating, especially in the winter, when there is heavy snow. The Chinese government has decided to replace the proportion of coal with renewable energy and natural gas to reduce pollution. It has launched Blue Sky and has made significant progress in 2018, with about 22,080 villages consuming natural gas instead of coal, generating electricity in 39 cities, as well as improving the quality of diesel fuel used in trucks and agricultural machinery. Beijing, through the Belt and Road Initiative, is seeking large-scale solar and wind power projects in the continent, some of which have been completed in Ethiopia and started in others in countries such as Tunisia and Algeria and in Aswan governorate in southern Egypt, which Egypt started with the participation of Russia and is scheduled to be completed within six months. The Chinese embassy's representative said that the Chinese company Tabia Renewable Energy is actively involved in the construction of the Benaban solar power plant in Aswan, the world's largest solar power station, which aims to generate about 2 gigabytes of solar energy. He stressed that the Chinese company TBIA has already completed the construction of three solar power plants in the complex of Benaban, explaining that the three stations have a production of 186 megawatts. TBIA is a leading global provider of green energy and smart energy services with operations in more than 20 countries and is dedicated to the sustainable development of the human community using smart, efficient and green energy. The representative of the Egyptian embassy pointed out that Egypt is very rich in the resources of solar energy suitable for the development of new energy industries, adding that the generation of photovoltaic power is efficient and that there were about 1,500 Egyptian workers in the workplaces at the time of the peak of the project, including about 1,300 people from Aswan, and that the project had provided at least 5,000 jobs. During the forum, Guo Hozhen, director of the Engineering Department of the International Renewable Energy Engineering Department at TBIA, said the three projects, which his company started a year ago, are owned by Acciona, with investments of about US $180 million. He explained that two of the three projects have already begun to sell power to the Egyptian Company for Electricity Transmission, under a contract of 25 years. The huge solar power complex is expected to be completed in mid-2019. The Benaban plant, located 650km south of Cairo, is being funded by a number of international financial institutions and banks, including the World Bank and the Industrial and Commercial Bank of China. According to estimates, the 37 square-kilometre facility will help Egypt increase its use of renewable energy to 22 percent of total domestic energy use by 2020 and will reduce global emissions by half a million tons of carbon dioxide per year. The Chinese company began implementing the three projects at the beginning of January 2018, on an area of 560 metres per project, adding that all the solar cells used in the project are Chinese-made, noting that the possibility of manufacturing these solar cells in Egypt is being studied through cooperation with the Egyptian government, explaining that it is not a difficult issue on both sides. Hozhen stressed the great benefit and experience gained by the Egyptians during their participation in the project, especially since this project is the first of its kind of this magnitude to be implemented in Egypt. "All the engineers and workers who participated in the project have a very great experience in the field of solar energy, competence and experience to work in any project either inside or outside Egypt," he said. "There are things that were the first time Egyptian engineers deal with them, as they were introduced to us during the course of our project in various stages, we faced many problems together over time, and the Egyptian engineers gained the experience we knew how to overcome these problems." Despite the fact that electricity was one of the biggest problems facing Egypt, difficulties have gradually decreased during the last five years, because of the huge power generation projects that President Abdel-Fattah El-Sisi launched and completed in the shortest time, resulting in the disappearance of the phenomenon of power outages. The government headed by Mostafa Madbouli is still seeking to improve the situation in order to serve Egypt's future strategies. China is one of the most important supporters in this regard.